Roblox offers a platform for entertainment where the users can set up and play games in the virtual worlds with their imagination. All the games from Roblox are constructed by Roblox members. They can feel free to create all type of games as they imagine. In Roblox, users can build various kinds of theme parks, like acting as a professional race driver or a star attending the fashion show or designing a home with their dream or more. Roblox can be downloaded freely and can be played on the modern platforms like smartphones, computers and tablets, etc. Do you know how to upload a Roblox game and then you can play it in Roblox freely? It can be done in a simple way. First, you need to enter the game on the computer that you would like to upload. Then click the button "Upload to Roblox". The related steps will be given by Roblox and you just need to follow it, then the upload will be completed easily. If you are creating a fun and interesting games, music plays an important role in setting up an atmosphere to the games, it cannot be neglected, adding music will help to take a vivid life and rich the characters in the games. How to upload music to Roblox? If you have no your own music, you can find it in the music inventory and add it your games, or you can get access to Roblox Audio Library which includes a lot of music. Additionally, you also can choose to make your own music upload to Roblox. Below we will introduce how to upload music to Roblox. It needs to spend you a small cost in uploading the music to Roblox, the purpose of this is to ensure our users runs Roblox safely and integratedly. The specific cost counts on the length of the files that you upload. If the files you want to upload existed in the inventory, you can enter the page of Configure and select the option “Configure” in the drop-down list. There are various kinds of options to assist you to make the audio files in customization. Turn comments on/off: You can decide whether the comment will be open for this item. Genre: Categorize the audio files and facilitate us to find it easily. Copying: You can decide whether to allow others to make a copy on this file. Version History: You can decide to recover your audio files to the previous version. 1. Find the audio file you need to upload to Roblox and gain ID from the asset. 2. Enter Roblox Studio and go into edition. 3. Right click on the workspace and choose “Insert Object”, add the sound you need to upload. 4. http://www.roblox.com in Properties Window and then before the script runs, it must be inserted into StarterGui. 5. Type into the code like this: Workspace.Sound:Play() and then make the game publish to Roblox. Since there are so many music on Roblox, you will wonder how to record Roblox with voice on mac. 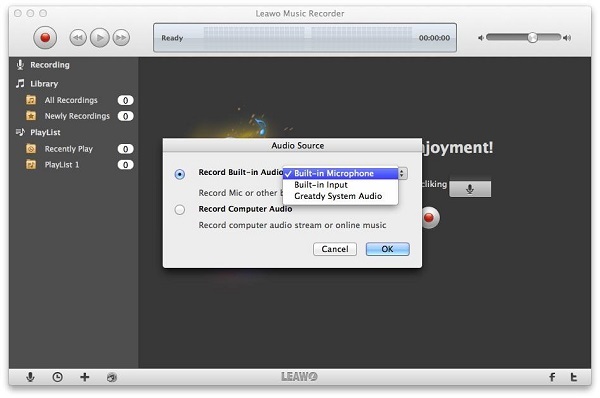 Here we will recommend you a professional tool- Leawo Music Recorder for Mac to record the audio from Roblox in an effective way. ☉ Save recordings to WAV, MP3 or M4A format. 1. 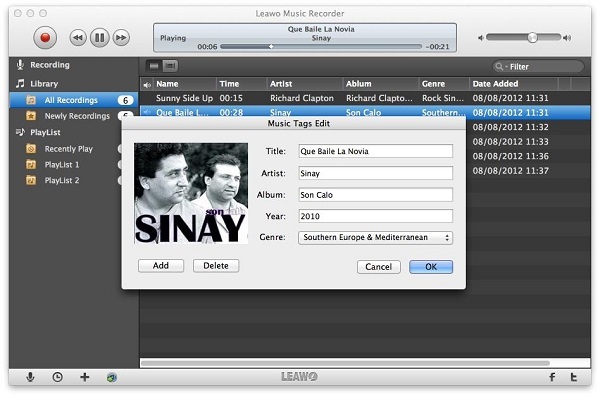 Run Music Recorder on your Mac and press the icon button “Audio Source” to choose which option of the audio source you would record. To control the recording start time and duration time, you need to click the button "Recording task scheduler" to make the settings. 2. You must decide the recorded files should be saved in what formats. 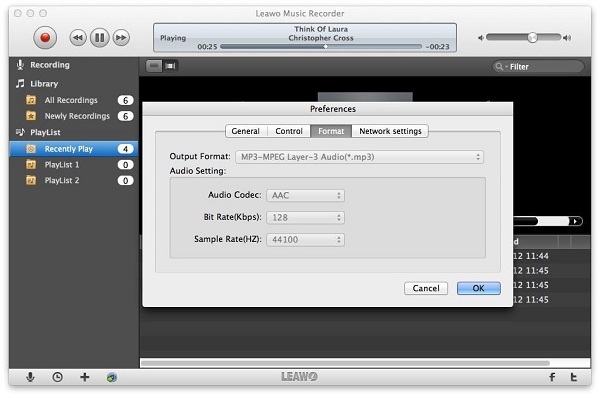 Yu can go through the pane "Leawo Music Recorder – Preferences – Format" to complete the format settings. Also, the parameter settings can be done here. 3. Click the red button “Start” in the main interface to make the software begin to record. It should be noted that the recording must work prior to source audio playing. 4. The recorded files can be automatically added with music tags, the tags information includes song name, artist and album,etc. You also can enter the "Library–All Recordings" to edit the files manually by selecting “Edit Music Tags” option.